"Most people over-estimate what they can do in a day and under-estimate what they can do in 10 years.” – Bill Gates. 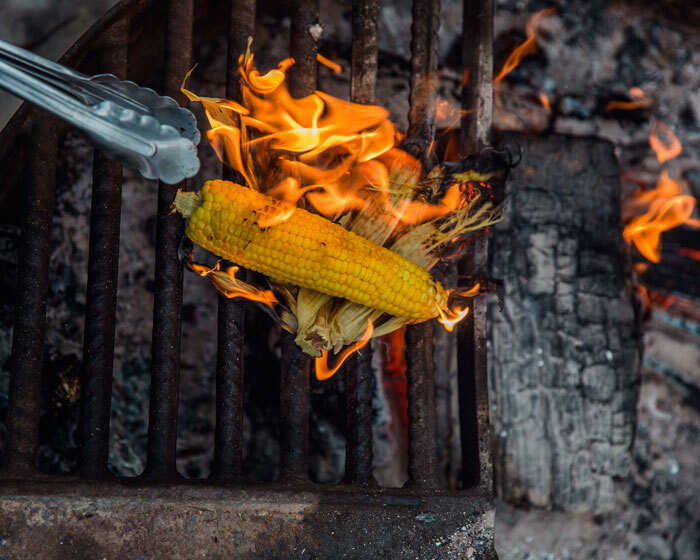 Wilderness Chef, Cooper Thomas did just that – and it’s not the first time he’s delivered unbelievable cuisine to those who want to dine alfresco! 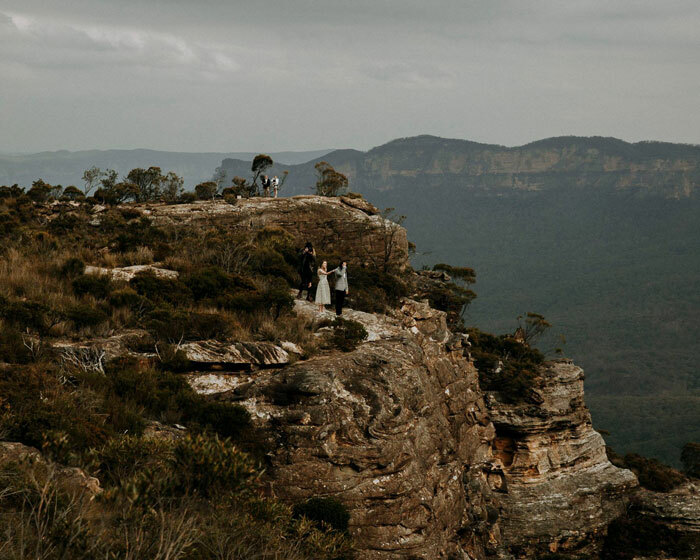 Think destinations like Queenstown in New Zealand, an elopement in Denmark, WA and the east coast of Tasmania, nothing is off limits to this adventurous cook. 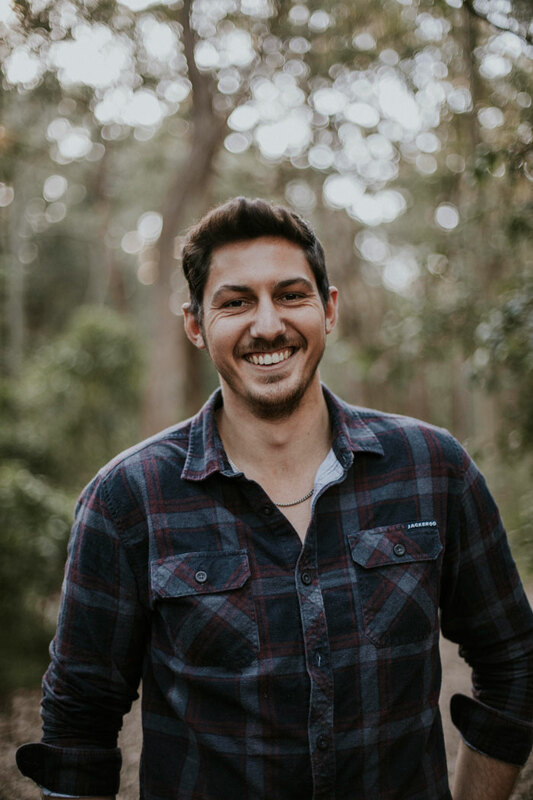 "The Wilderness Chef was created as a way of combining my passion for cooking and all things food with a love of the outdoors, adventure and travel,” Cooper tells AGFG. "The original plan was to cater for ‘anteloping’ elopements [adventurous eloping] – within six weeks I had an enquiry for a 120-person wedding 12 months later. Based in Newcastle, the majority of events Cooper caters for are weddings and elopements, which are usually booked 6-18 months in advance, giving him ample time to consider the logistics of staff, plates, wages, insurance and everything else that comes with running your own business. "Any location, any occasion, any number of guests… I take this extremely seriously! There are simply no limits to what The Wilderness Chef will create,” he says. Logistically, the most challenging event he has catered for was an elopement in Denmark, five and a half hours south of Perth - Cooper had purchased a brand-new catering van the day before setting off on the round trip of more than 11,000 km in just under three weeks. "As you can imagine, absolutely everything I required for this event had to be planned for and packed in Newcastle. Multiple flat tyres, multiple wild animal encounters and Australia’s longest stretch of straight road (180 km approximately) made for an incredibly challenging yet rewarding event. 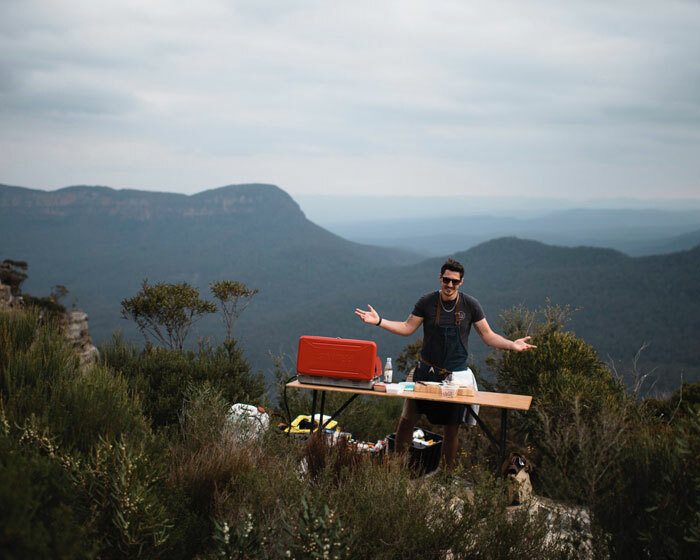 A multi-day photography workshop held in the Blue Mountains was one of his first catering gigs, where he personally cooked breakfast, lunch and dinner for participants at Perry’s Lookdown campground. Wind, rain, heat and fire bans all played their part in this extreme event, along with three trestle tables, a large gazebo, custom-made hooded charcoal grill and oven, a portable gas stove, 82 L portable fridge and a generator. So, what can diners expect on the menu? For the dinner on the cliff at Landslide Lookout, Cooper served up prosciutto and caramelised fig on charred sourdough, Cajun spiced pork neck soft tacos, shaved slaw and sliced almonds, followed by ginger, lime and chilli baby squid, grilled asparagus and snow peas; with deconstructed lemon meringue pie, lemon and vanilla bean curd and meringue for dessert. Cooper says the challenges of open fire cooking are endless and also limit the types of food that can be produced, along with the cooking methods used. "Fires don’t come with temperature controls, meaning it is extremely difficult to maintain a constant temperature. You are exposed to the elements such as wind, which is a safety concern and logistical nightmare, as it tends to blow ash on all your food and preparation surfaces. Cooper says wood that is too wet will smoke rather than burn, which is great if you want to cook smoked salmon or kingfish, but not ideal for grilling a steak over. 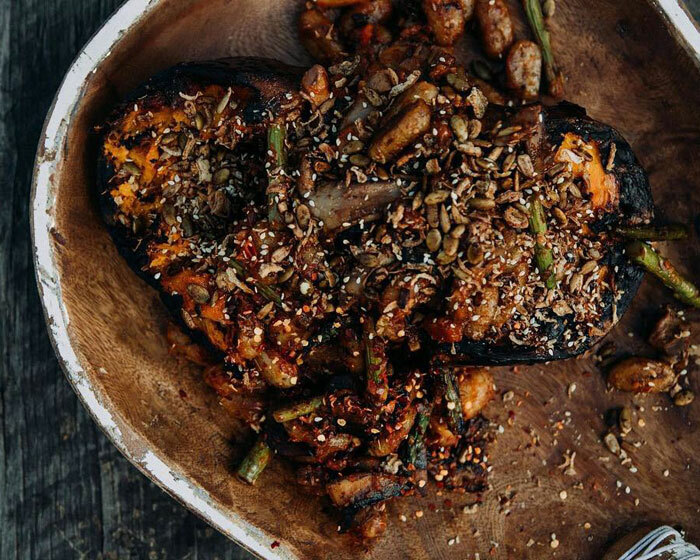 Cooper shares his recipe for charcoal roasted whole stuffed pumpkin with us, which uses simple, local and seasonal ingredients to produce an incredibly tasty campfire dish for all the family. We asked Cooper what the most outrageous ingredient is he has cooked with and the answer is surprising… tonka beans! This South American legume with the aromas of cherry, vanilla, cinnamon and almond, has been banned and made illegal to sell in multiple countries around the world because of its chemical makeup, which can cause liver problems in high concentrations. At age 25, Cooper says the next five years of his life will hopefully be his most productive and successful to date. 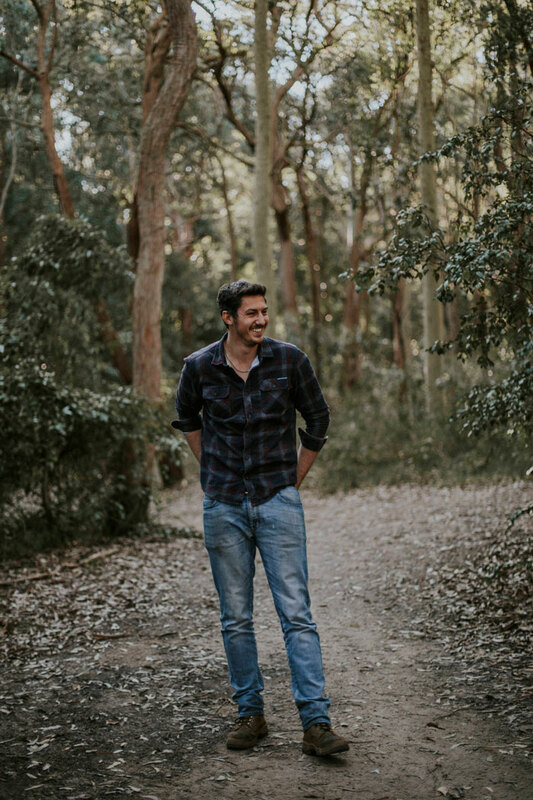 "I plan on growing The Wilderness Chef while continuing to expand into other areas such as food production, consulting and offering beverage services. I have a few specialty foods I prepare, which I believe would be great for the retail, wholesale trade. Cooper believes some people are far too focused on changing the world in leaps and bounds that unfortunately they end up in a far worse place themselves. "Everything I have created in the past few years has come from within me personally. Am I changing the world? No, not yet anyway – but I strive for greatness every single day and hope that rubs off on someone, somewhere. It seems there is nothing this adventurer can’t do, and we look forward to seeing where The Wilderness Chef cooks next!